Jennifer Saia, Executive Director of the Luxury Yacht Vacation Division at IYC, provides an insider’s guide on what to do when chartering around New England. New England is Americana on steroids. From Block Island to Martha’s Vineyard, Newport and Nantucket to Cape Cod, this region is wholesome, historic, beautiful, and the climate is fabulous. It is so precious to see people enjoying the water as they do in New England, from the beautiful sailboats out whiling away the day to the fragrant clambakes as the sun sets. Experiencing New England by boat provides an entirely different perspective to this fascinating destination. 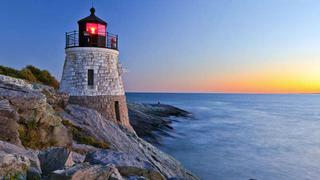 First, spend a couple of days in the historic and lively town of Newport, Rhode Island. Tour a mansion or two. Do the Cliff Walk with its breathtaking views. Race on the famous 12 metre sailing yachts. Indulge in a private clam/lobster bake at Rose Island. Brunch at the inimitable Castle Hill. Enjoy strolling the streets and exploring the wharfs that make up this special part of New England. While it’s easy to spend a whole week in Newport, you can work with your agent to split up your charter by discovering Newport at the beginning and end of your holiday. Midweek during your excursion, you might travel to Block Island; it’s only a couple hours away but you’ll feel like you’re a world away. Rent scooters to circumnavigate the island. Stunning cliffs, sand dunes, and incredible landscapes on scenic country roads await your gaze. Tour the lighthouses. 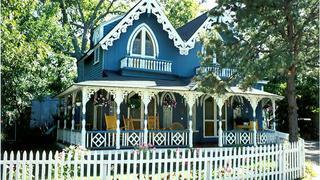 From Block, spend the next several days on Martha’s Vineyard. Anchor or dock in Edgartown nestled among some of the most gorgeous and expensive homes in the nation. A harbour ride by your yacht’s tender is the perfect way to ‘tour’ these majestic homes. Be sure to get ashore as Martha’s Vineyard shopping is a must. There’s something for everyone, even if it is simply an afternoon ice cream or a bite of famous fudge from one of the many sweet shops. Renting bikes to take in Oak Bluffs is a must—each street is filled with brightly-coloured gingerbread houses and the marina usually has some action from local and visiting fisherman displaying their catch. Once one of the busiest harbours, the now quiet town of Vineyard Haven, is worth a visit, especially to The Black Dog Tavern for dinner. Rent Jeeps and check out the diversity of the island. Around every corner is a beautiful view ready to be captured by camera. The best sunset is at Aquinnah (Gay Head), complete with a lighthouse and multi-coloured clay cliffs. 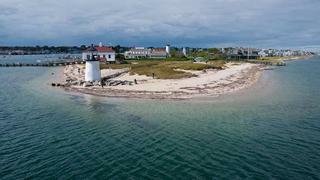 The final island stop in your itinerary is Nantucket, a bit more exclusive than the other two. Once a major whaling port, now well preserved cobblestone streets reveal opulent mansions, antique stores, art galleries and elegant boutiques. Try surfing off one of the many beautiful beaches or explore the towns outside the hub of activity and the Nantucket Boat Basin, all of which are accessible by a network of bike paths.